(Savannah) Georgia on my mind. Our home in Savannah was the spectacular Skidaway Island State Park with long leaf pine and towering oaks. 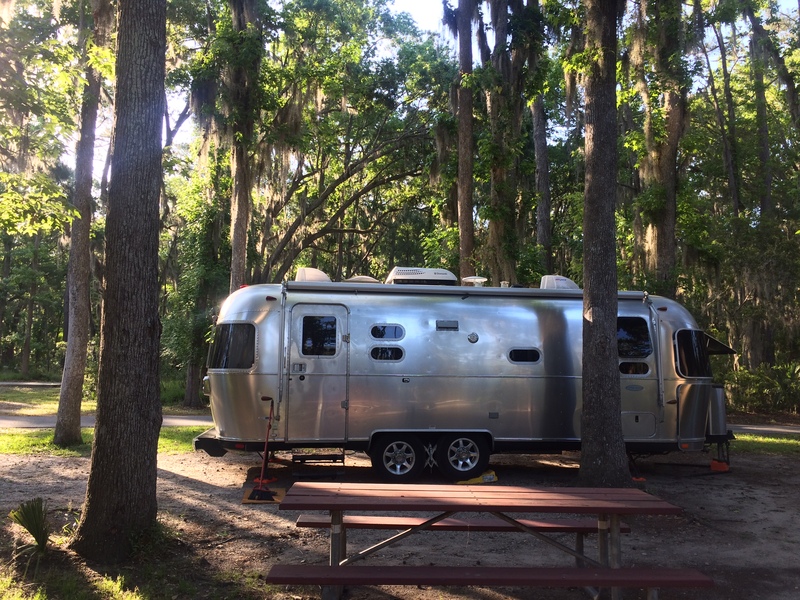 We both needed the four days of delectable sleep and complete rest that we experienced outside of Gainesville, Florida at Paynes Prairie Preserve State Park. As when waking from a long night’s deep sleep we moved slowly and intentionally, first sitting symbolically upright and then consciously putting our feet firmly on the ground, exhilarated to find all our parts still in working order. We planned our next stop to be a four-day stay exploring a city that was relatively new to us, Savannah, Georgia. We knew bits and pieces of the reputation of the city’s glorious public parks (there are an astounding 22 squares all distinctive in their lush beauty), of the history, and of the wonderful food, and we were prepared for that. Savannah did not disappoint us. 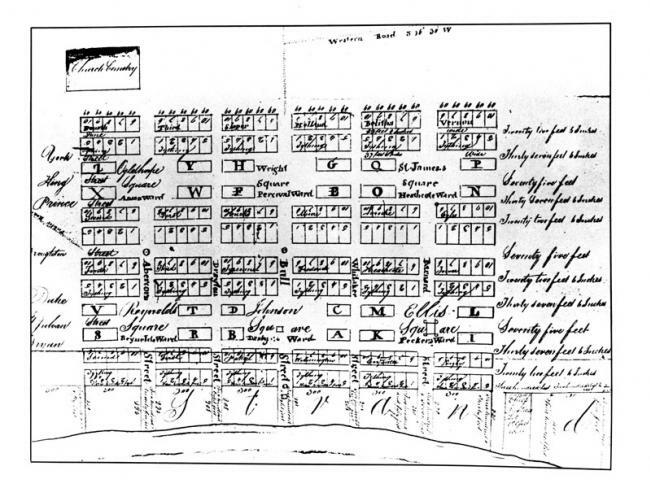 Oglethrope’s original plan for the city of Savannah, a grid with clusters of houses and shops interspersed with open spaces, seen here as the larger rectangular shapes. The parks are phenomenal and a testimony to the wisdom of planning the city which was founded in 1733 on a forty-foot-high bluff overlooking the Savannah River, eighteen miles up stream from the Atlantic Ocean. The city plan is distinguished from those of all other colonial towns in the United States with its repeated pattern of connected neighborhoods. Laid out by General James Edward Oglethorpe, it was the last colonial capital to be established by England in America. When the early plans were drawn up way back in England by Oglethorpe, he consulted the city plans for London. 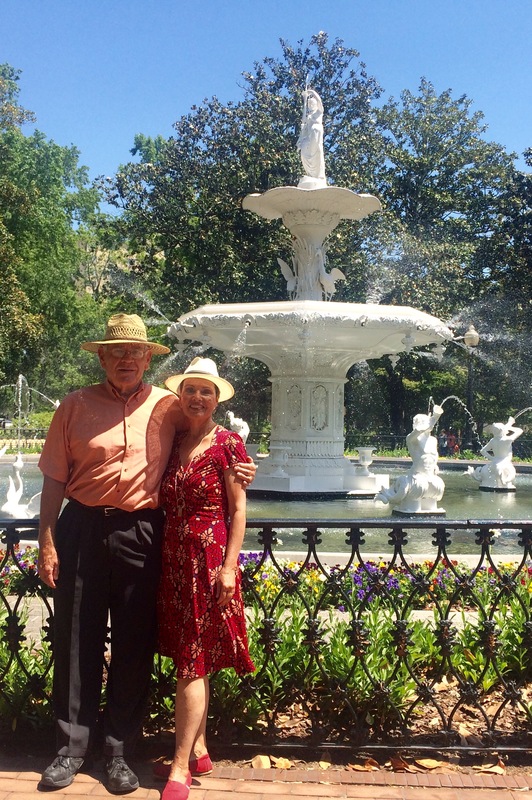 We loved visiting Savannah’s well-known Forsyth Fountain on a gorgeous Sunday. With a distinctive pattern of streets, houses, and public squares the plan is designed for expansion into open spaces surrounding the original settlement making this plan unique in America. The benefit today is that the grid makes it easy to navigate around the various parts of the historic district, a one-mile square that can be easily explored on foot with great walking shoes. For those of you who have followed these posts, you know that each reveals something about the pilgrimage that we both realize we are on. This one is particularly personal for me because with so many choices, we decided to be open to the unusual parts of the city’s history, allowing for serendipitous guidance. What I received was deeply moving. On the first day, for example, while exploring Johnson Square, the glorious white columns of Christ Church came into view. We learned George Washington had worshipped at this Episcopal church on an early trip to Savannah. Peter on the steps of Christ Church. Rev. John Wesley was rector here in 1736. This is the third building on the site. The church was locked, however as we descended the stairs after attempting to see inside, a man stepped out of his car and asked if we would like to go into the church. He was one of the guardians of the building and he led us in the back way, up the winding and narrow stairs to the magnificent worship area, bathed in light and simple and ethereal 19th century beauty. Breathtaking. I am now going to address the two most powerful of my Savannah experiences. In these, we were given the gift of hearing the stories of those whom we had not known of before. Our first experience was at the First African Baptist Church in the northwest corner of Franklin Square. The simple building marks the fifth meeting place for what is the oldest black church in the country, founded in 1773. The First African Baptist Church with its red doors which showed the community the church was completely paid for. The current building was constructed in 1855 with money and labor provided by the mostly enslaved members who worked on the surrounding plantations during the day and then, remarkably, walked miles to town and built their brick church at night. It took four years to construct with the bricks made on the site. The church was an important stop on the Underground Railroad and to this day, religious symbols carved into the pews provide silent testimony to the enslaved people who were waiting for their time to escape. 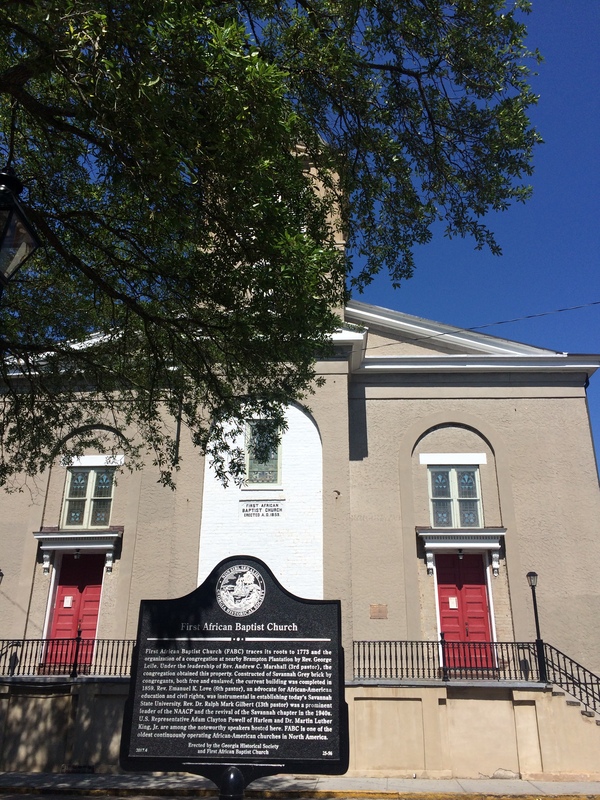 The church also houses the first museum in a black church in the area with archives that reach back to the early 1800s. The tour was powerful and later, Peter and I stayed behind to talk more with our tour guide, Joe, who is a treasure chest of information and illuminated the church and the community history in unexpected ways. As I write this, I know that Joe has just received a copy of a book I have gifted him on the history of racial justice in the Catholic Church, a testament to the depths of the conversation that we had and the distances we traveled with him. It was mysterious and wondrously moving. 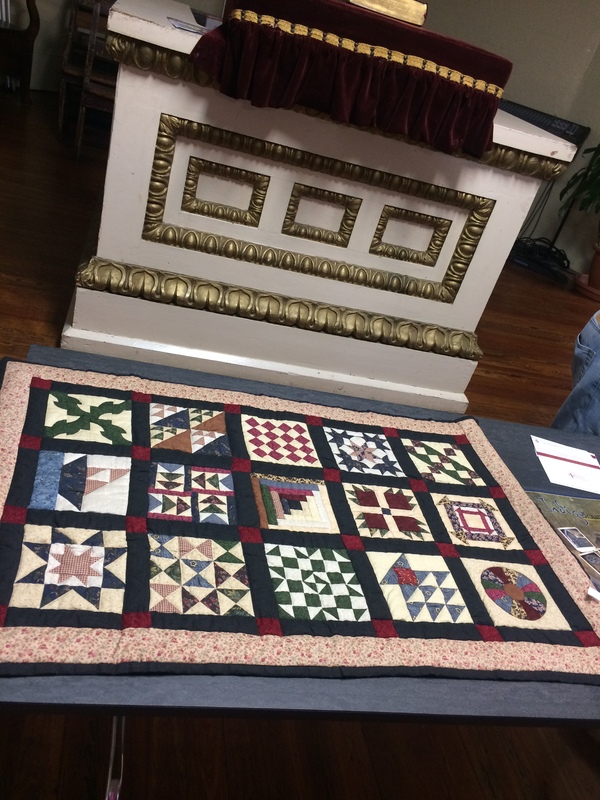 The AB quilt shows the patterns that would be posted for the Underground Railroad. Each square says something specific, like “head to the river”, or “walk a windy path”, or “climb up the banks ahead”. The following day, Sunday, there was a special service at the church to honor the pastor, Thurmond L. Tillman, on the occasion of his 36th anniversary of service. Peter and I decided we wanted to experience the “AB” (this is their shorthand name for themselves as African Baptist) and we decided to attend. We were warmly welcomed to the celebration which was a moving and joyful experience of preaching and singing and testifying and witnessing the movement of the Holy Spirit in a way that neither of us had ever experienced before. 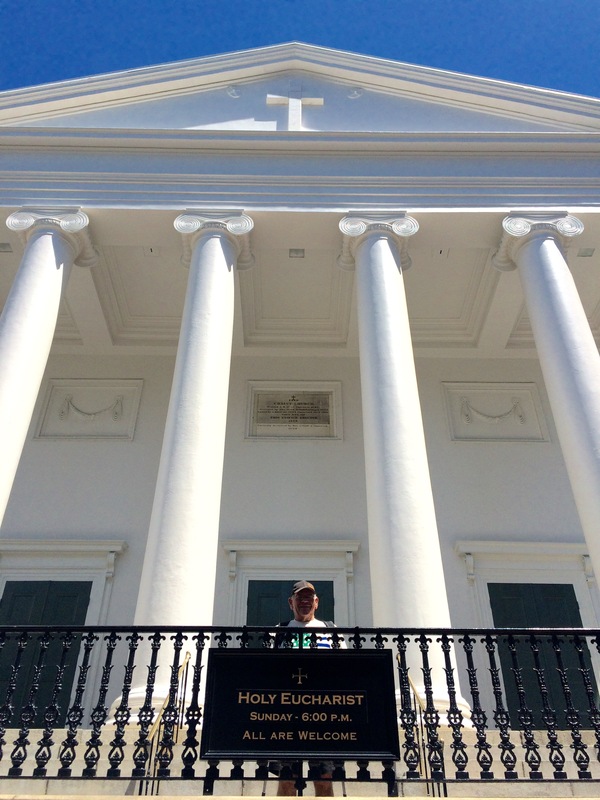 The second new voice that we heard came from a serendipitous visit to Congregation Mickve Israel which we discovered on one of our walks through beautiful Monterey Square. This is the third oldest Jewish congregation in the United States and the oldest in the south, founded in 1735. The synagogue was under renovation but we gathered for a tour in the assembly hall. After welcoming remarks, we proceeded upstairs to the museum. The deerskin Torah from 1400. One of our fellow tourists was from Israel and identified the text as Deuteronomy 6:4, “Hear, O Israel: The Lord our God, the Lord is one”. 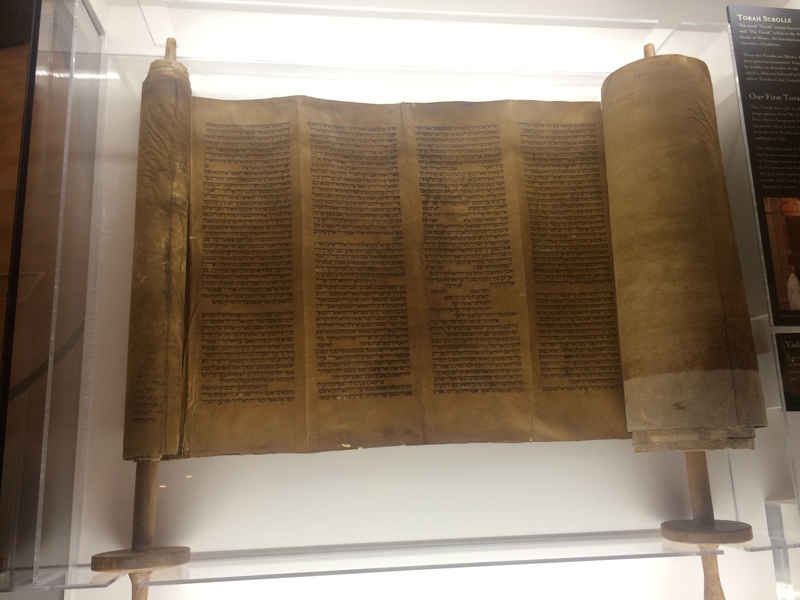 In the first display case was a Torah, dated to 1400, which had come over with forty-one settlers in the largest single migration of Jews to the colonies. They sailed from London and the group of mostly Sephardic Jews had recently escaped from the latest round of religious persecution of Jews in Spain and Portugal. The Torah was on deerskin. The guide told us that deerskin was used in the 1400s by conversos, Jews who were forced to convert to Christianity during the earlier Inquistions in Spain and Portugal. Deer was a kosher animal but in such common use that ordering skins for a Torah would not have attracted much attention among those who noticed such things. For conversos who had converted to Christianity in the 15th century, many secretly wanted to keep their holy scriptures with them and a deerskin Torah facilitated that. The neo-Gothic architecture of Mickve Israel reflects the fashion of the day in which this version was constructed. It is the only Gothic synagogue in America. This chance visit to Mickve Israel was really a surprise for me because just last year I learned that fifteen generations back, one of my ancestors was a Sephardic Jew who converted to Christianity following the Inquisition in Spain. In the 1500s, she and her husband went to Sao Miguel in the Azores and records there show that she was made to do public penance when labeled “sabatinada”. This probably occurred when she was drilled with rapid questions about her new faith for who knows how long, and at the end someone must have found some error in her “new Christian” life. She was made to parade through the streets in penitential garb, partially for penance and no doubt partially to intimidate others that may be like her. The family records indicate that through her, some of her descendants acquired their Jewish ancestry and others (my direct line included) remained in the Christian faith. All of this led to a profound experience of the power of listening to the subtle guidance that landed us in very different houses of worship neither of which were familiar to either of us. After this trip, I received the results of my own AncestryDNA screening and it revealed an ethnicity (around 10%) to European Jews of unclear domicile. And so I am today honoring my ancestral converso, Maria Fernandes. To paraphrase Ray Charles, this memory comes as a song to you, “as sweet and clear as moonlight through these Georgia pines”. God’s peace be with you. View from the cliffs of Nordeste, Sao Miguel. This is the island where my ancestor Maria Fernandes lived in the early 1500s. Her story is told here. Peter and Liz continue their pilgrimage to here, moving next to Charleston, South Carolina in their Airstream, experiencing the depths of human history in new ways. 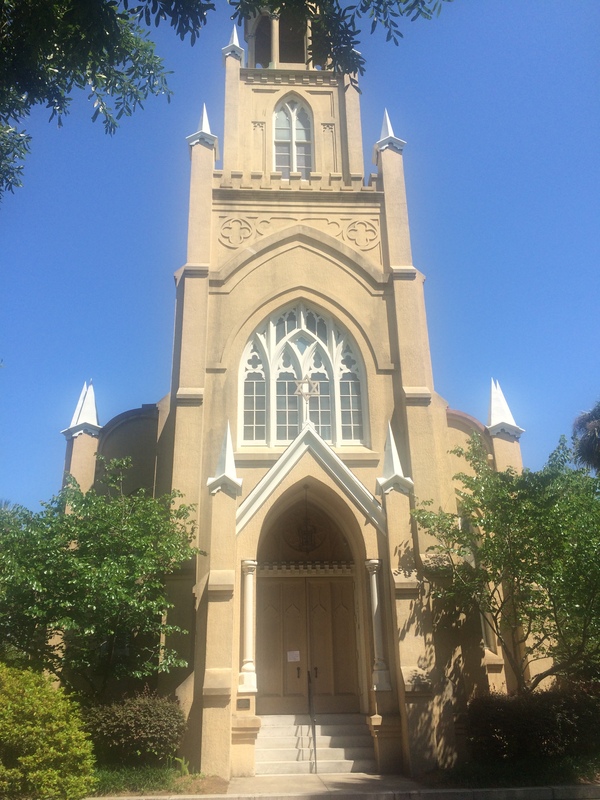 This entry was posted in Uncategorized and tagged Airstream, First African Baptist Church, Forsyth Fountain, Mickve Israel, Savannah by lizbrown489. Bookmark the permalink.